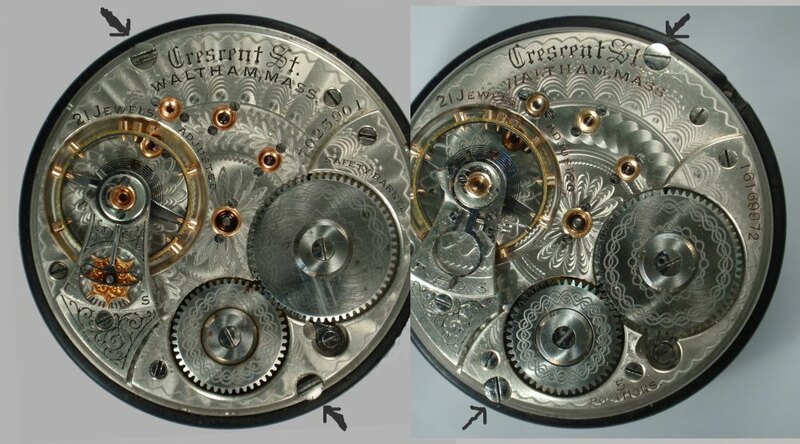 There are 2 case screws on the Model 92 movement. Initially they are positioned with one in the barrel bridge between the winding wheels and the other directly opposite it. Later on in production, at 14002001-14003000, a run of Crescent Streets, Waltham begins moving the screw on the barrel bridge to the left, near the edge of the bridge and the screw on the opposite side of the movement is moved the same distance to the right. To simplify the means of referencing the positions, the writer refers to the position on the barrel bridge i.e., between the winding wheels (Bet) or at the edge of the bridge (Edge). Throughout the next several runs, it is at times found between the winding wheels and at times at the edge of the bridge. This inconsistency can even occur within the same run of movements. At 14104001-14104500, a run of 21 jewel Vanguards, it is found at the edge of the barrel bridge and except for a very few examples, remains there throughout the remainder of Model 92 production.